La Dolce Vita: Literary Love: They're Here! Like so many people, I absolutely fell in love with the gorgeous Penguin Classics series designed by Coralie Bickford-Smith when they debuted last November. The ten book series was inspired by patterns and each book includes a matte foil design. My birthday is in November, so I thought I'd ask for them for my birthday. However, at that time, they were only available in the UK through Waterstone's for about 40 pounds a piece. Fast forward to mid-February, when I came across this blog post. I was ecstatic to see that they are now available at Chapters Indigo bookstores in Canada and that they ship to the United States. The best part, however, is that they are going for $14.99 Canadian, which is about $11 U.S. dollars! I ordered them a couple of weeks ago and received them about four or five days later. They are incredibly beautiful in person and I hope to pass them on to my children some day. I plan to go back and read or re-read each book in the series very soon. If you are interested in ordering a set for yourself, visit Chapters. Unfortunately, they do not show images of the books, but I do have the exact ISBN numbers. This is what I used and they were exactly what I was hoping for. Yay, go Canada! I love Chapters Indigo! I buy all my books from them! Yay! They are beautiful books and look lovely in your home. Do you remember how much the shipping charges were? Kylie, I think shipping is $7.99 Canadian per item. That includes customs charges as well. Omg! I must have those. The price is amazing. Love your lamp as well! I LOVE IT!! I NEED SOME!!! LIKE NOW!! Thanks for the compliments on the lamp, girls. It is Circa Lighting's Quatrefoil floor lamp. I think they are stunning Paloma. I have those classics but it is nice to see them encased in such loveliness. Classic books with lovely new covers! I'm loving this! 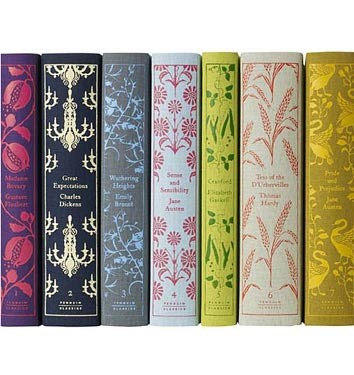 I am so buying myself a present.. i was about to buy sense and sensability and was looking for a pretty copy and i always love copies of jane eyre and wuthering heights and all things austen... gorg! Thank you! Oh, my gosh!!!! Stunning and covet-worthy!! I love these; I plan to order my favs soon! Oh these are beautiful. I want to go right out and get a set! Absolutely gorgeous! I have a belated birthday gift to buy, and it just so happens the person is an avid reader. I think you just gave me a great gift idea - Muito Obrigada! books are one of my favorite things...ever and good looking books might just be my favorite thing. These are amazing. I love a good looking book especially old ones but I guess I really need to pick up on enjoying to read them. To many things to do and I would rather look at pictures or watch a movie, I know I know horrible but I always blame it on my creative side of the brain. Anyone with me? I am so jealous. I love them dearly. They are very glam and I love your quatrefoil floor lamp! The book store should pay Little Green Notebook a commission...I too bought these books and they are beautiful. I put them in my dining room on the buffet until I decided where to put them, but they have ended up staying there as I love to look at them when passing by the room! The quatrefoil lamp looks great. It is such a pretty design - I love many of the Kasler designs for Visual Comfort. I know I had mentioned in an earlier comment that I thought shipping was $7 CA per book. That is what I remember the website saying. However, I came across my confirmation e-mail from when I ordered the first 7 books (I later decided to take the plunge and order the whole set despite that I don't like Tess of the D'Urbevilles, etc). They're just beautiful, and how lovely that you included the ISBN numbers! Will definitely order a few as well. Love, how beautiful and functional. Thanks for the great post. What do these lovely books look like on the inside? Are there notes, annotations, etc in the back? Thanks. What absolutely lovely books. I am off to order a few for myself. Love the inspiration here! I cannot find these on the webiste any longer...does anyone ahve any clues as to where to get these? Madame bovary and crime and punishment. I am willing to pay a lot for them. Mr & Mrs Smith Contest: The 4th and Final Clue!